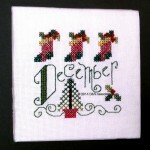 Victoria Sampler offers three designs to reflect gifts given by the three Magi. This sampler symbolizes the gift of Myrrh. According to the legend, Myrrh was given by Caspar, the King of Tarsus. In October 2013 Stoney Creek website offered two free designs: Christmas Tidings Bell Pull and Express Faith. 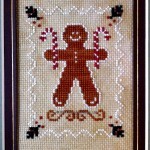 This was a cute design to work on and I would enjoy stitching another to give away as a Christmas card. 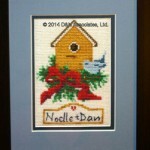 I purchased the design and frame from Stoney Creek Stitchery website. Design stated worked over 2 threads on 28 count that this design would fit the frame. I purchased this kit on sale, Joann website. 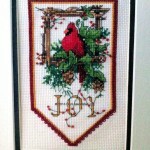 It is a Dimensions Banners Cardinal Joy Mini Counted Cross Stitch, Finished Size: 10″Long. 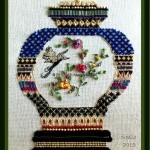 The kit includes 14 count Aida, the decorative wire hanger, design and threads. 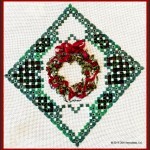 The stitched pattern came from a downloaded free design from Herrschners.com. 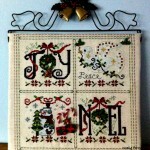 Cross stitched, the pattern Happy Holiday Birdhouse (3.5 inch x 4 7/8 inch design) was designed to be stitched on a towel. If you use any photos or comments from my site I would appreciate your providing a link to my site a-stitching-good-time.com. Copyright © 2017 D&N Associates, Ltd., a-stitching-good-time.com. All Rights Reserved. The Magazine Premium Theme by bavotasan.com.